‘The Most Fearless Animal’, if you think about it, there are numerous strong contenders for this title but according to the Guinness Book of World Records the honey badger deserves the title. It might shock you because, when hearing the phrase, you’d imagine an animal like a lion or a tiger. 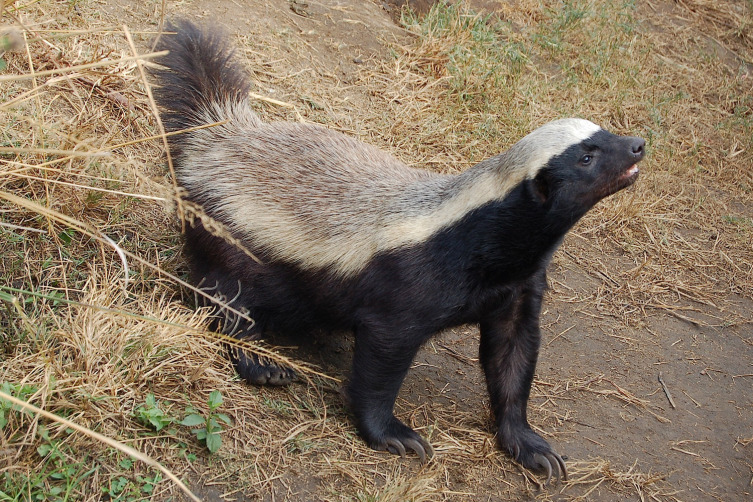 Some of you might not even have any idea what a honey badger looks like. Don’t get us wrong, the honey badger rightfully earned its title; it was built to be fearless. Honey badgers were designed to fight and because of their skills and physical design they became fearless. Skin that’s ¼ inches thick and has a rubbery texture to it is quite tough; their skin was so tough that traditional arrows and spears could not penetrate it. If the honey badger would receive a blow from a machete their skin can take it, thus they can defend themselves from the sharp teeth of enemies; they’re not invincible, the damage is there but it won’t cut the skin all the way through. A honey badger’s teeth are extremely sharp alongside incredible jaw strength. That deadly combination of sharp teeth and jaw power is what they used to eat every part of their prey which includes the bones. So how powerful are their jaws? A honey badger has the ability to eat a turtle including the shell without breaking a sweat. On top of that, but a honey badger is immune to the majority of deadly venom; there are times that honey badgers were seen fighting snakes. But that’s not all, but honey badgers are observed to be quite intelligent. Honey badgers are smart enough to use simple items as tools when they’re hunting and catching their prey. You won’t see these traits on other animals.